The most awesome and useful tool....and not just for the kitchen. This is fantastic and useful. Keep it up! I hope it can edit the favorites. I mean, I hope I can make alphabetical list. I don't like the list without sorting rule. Yea... this is really suite for me..I like to cook..now even not to scare overcook food...awesome!!! Very handy. Simple to use. I use it all the time. Great timer,has everything you would need. I'm sometimes timing bread rising or baking and yogurt which takes hours and is easy to forget. This app understands multitasking. It really helps me. It's easy to use and rates a place on my front screen. This is an awesome app! I'm very pleased with this purchase! This apps come handy when baking! Simple yet neat! You got to love an App that works as imagined. Four stove top burner timers with labels and four oven timers with labels. Keeps the meals timed. Good meal timer to the rescue. Finally an app that does most of thing I need! Again marvelous. Frogmore stew done in two big pots on stove. And able to time each item as needed to be timed as waterlogged potatoes, corn on the cob, & fresh shrimp is not tasty. Over cooked shrimp is a waste. Everything perfect. With four burner timers going and if needed a fifth I was able to easily juggle things. If you like to cook and have multiple dishes going at once, this is a must. 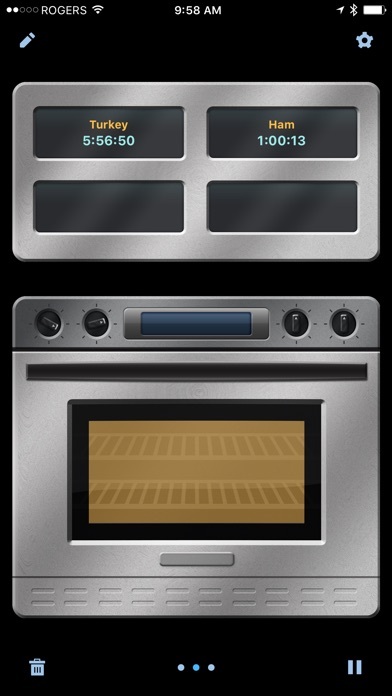 Has multiple burners, oven, etc... My wolf range has 1 timer, this was a must. Works perfect! EXCELLENT!! Especially for one who is slightly ADD and new to cooking, this timer enables me to track multiple items on the stove (often 3) and in the oven (often 2) and never miss a beat, never heat nor over cook. The only change I would suggest is having more charming buzzer sound options. But the at the least the one buzzer it has cannot be ignored - so I DO react quickly! With sound options I would give this 5 stars. Its just awesome. 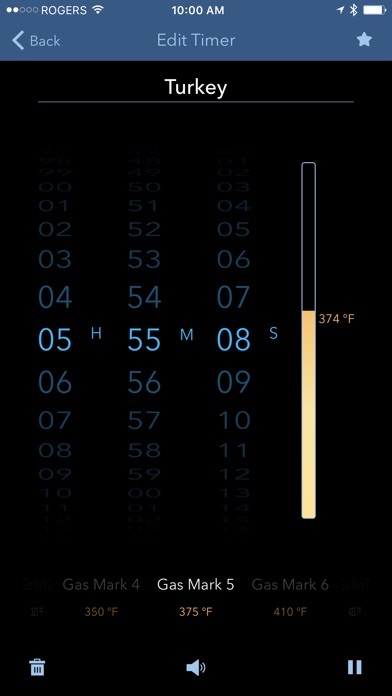 But if I'm not wrong, alarms stopped to work after the iOS 5 update. It simply won't beep if the iPad is locked, please fix! I like the app, but one very annoying flaw, once the timer counts down and you dismiss it, it always goes back to zero and not the time you had set to begin with, that really slows me down. This works way better than all of the other timers I have. LOVIN' it!!!! No problem whatsoever with it. And thats a huge bummer. All else is great. The sound isn't working since I upgraded my iOS. I LOVE this app. It was the best of all the timers, until now. Please, fix it. I used to use it all the time! And I WANT to continue using it. Unfortunately on my new iPad this will not make a sound. That is absolutely not OK for a timer. The iPad one's Version still works fine. So I still use this and would give it five stars if it worked on all of my devices. Well designed. Great app worth every penny. New life for this app! Great app with great features! I was having issues trying to download the application. I contacted app support and they responded right away. Come to fine out iTunes on both my Computer and my iPad had to be restarted so the iTunes app would work properly and allow me to download the application. So I am blaming Apple for this falure and not the App. Very hand kitchen tool, and you're ot confined to the kitchen. I loved it the first time I used it! Had four timers going at once, it was great! Tried it again today and it will only set one timer and seems to be stuck on the one timer. Not worth the money, not dependable. Having to keep track the old fashion way with a clock and pencil. The best when making multiple items. This app is worthless. Unless you leave your phone in the app, you get no notification of timers completed. Save your time and money and purchase Thyme instead. 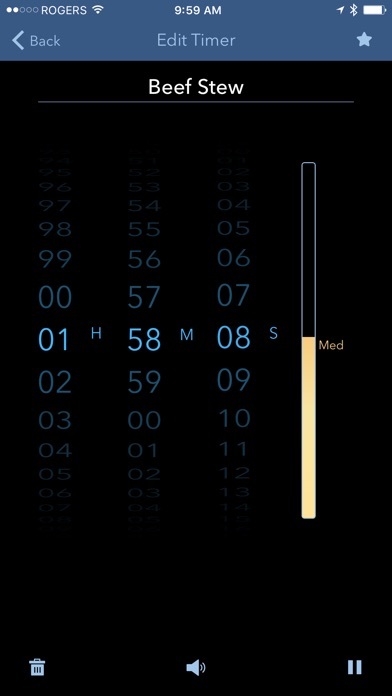 If your iPad screen goes blank to save power your timer does NOT alarm. I like the setup but this is not acceptable. I will delete if it is not fixed with an update soon. The latest update no longer gives an audible alarm at the end of a timer cycle. That renders this app useless so I deleted it. Yes, my volume is turned up and, yes, I used the most obnoxious tone I could find in settings. And yes, my iPad Air with iOS 9.2 works fine with everything else that make sound. My Pebble smartwatch has all of the timers I need now so this whole class of apps is obsolete anyway. I'm a really good family cook and I like this app very much. It helps get multiple dish meals all to the table on time. This app now works as it should. I suggest more testing next time y'all update this app. It seems that the timer is working again. It was not going off when the iPad/iPhone was locked or asleep. As such, I'm still a little nervous about using it. I've been setting 2 timers so I have one if this doesn't go off. If it continues to work reliably, I'll eventually trust it enough for it to be my only timer once more. I cook a lot, most of the time as I'm working. I have never had a problem, it always goes off and allows me to multitask and then take a break and eat! Fairly good, with potential, but after about 3 weeks of use, seems to have a few glitches. Their support site seems to be a message board which does not seem to get checked very often. My posts seem to be unanswered even after a couple of weeks. I was unable to find an email address. Please check your site more often. This is a great example of how to wreck a good product. One screen timing, audible alarms, and selective temps are now gone. This is a step down, not up. How do I get the old version back? If there was a zero star rating this would qualify. I use the the app as a typical kitchen timer but I now I am required to wait five minutes between eye drops given to my dog for dry eyes and my wife as a result of cataract surgery. The timer is a valuable device to time these two different events. I use to be able use a standard countdown timer, but no more. I am very pleased with the response from the developer for this product. Just the other day, March 22, 2017, I wrote a review about my concerns with losing the KitchenPad Timer app. Now I see that there have been improvements. I was afraid to update because I thought that there would no longer be an app. But after reading about the most recent update I was encouraged and very pleased. I am happy to find that the developer has plans for more improvements in the future. Now I can cook something besides Pork and Beans - just kidding! Thank You! - and now for my previous review of March 22, 2017 >>> Afraid to update because I do not know the status of the developers/company. I've had a few developers/companies abandon or switch my app for another, rendering the app that I paid money for unable to update in the future. I am hoping that will not be the case with this one, but only "Time" will tell. 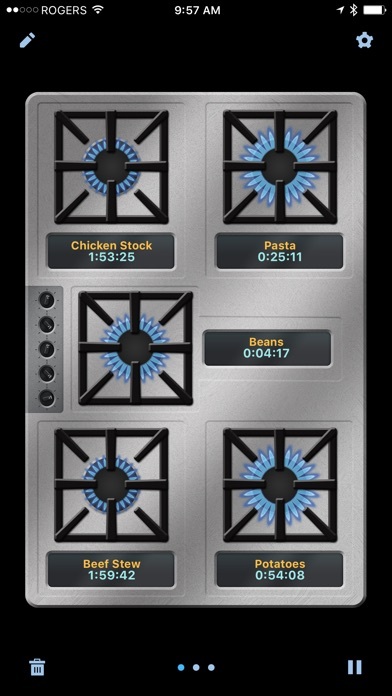 Was a free app of day -- has multiple timers on layouts like stove, broiler -- but would be more useful if could have microwave (with intensity) and slow cooker (with heat) and pressure cooker with pressure notes... Also sound are ATROCIOUS. This seems more like some class project than a serious effort to be a kitchen timer -- definitely not worth any purchase fee. I love this app. As an avid bread baker, I use this frequently to keep track of the bread rising so I would give it 5 stars if they added a 3rd screen for miscellaneous cooking items like kneading dough, rising dough, marinating, etc. Extremely well done app, by far the best of it's kind. I highly recommend! If you like everything you cook finish at the same time... This is your app!!! As I rebuild my memory from a stroke, I needed reminders for the oven and stove. The developer thought of labeling the timers, location of burners, frequent favorites, and so attractive. Thank you. KitchenPad used to work but it no longer alarms at all. Alarms work in the default Clock app, so it's clearly a KitchenPad issue. Don't waste your time going to their web site and trying to send email to them about anything. *ALL* messages to the company get marked as spam by their site on and aren't delivered. My dinner got burned because of this app and I got burned because of this company. This was a great program but ios5 broke it. Unfortunately the new update does not fix the problem, it still will not work when in background or iPad is locked. When fixed will rate a 5 again. Awesome app. Even the pros can struggle at home trying to get things out at the same time without ignoring their guests. Really helps you stay organized. Stand alone timer equivalents go for $30+. Worth every penny. Get this app. ...far too quiet to be useful. And, yes, I did "turn the volume all the way up." 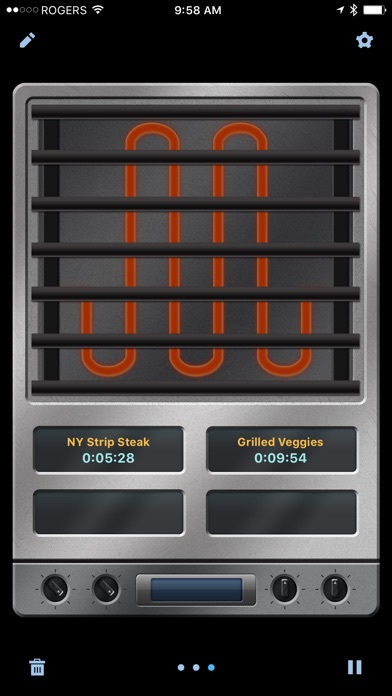 I like the premise of this app, but I do a lot of BBQ that requires long cook times & constant temperature checks of the grill. A timer for BBQ cooks that would allow for reminders without detracting from total cook time would be very handy. I really enjoy things for the kitchen. This app is my new favorite toy. I used it to time two things as soon as I downloaded it. One in the oven and one on the stove. Super easy... Not using my timer on the microwave frees up the microwave while I time my food! Wish I had created this app! Thanks!